This year’s Challenge was subtitled ‘Egg Challenge’ as it involved constructing something on wheels that could carry an egg, with the aim being for the construction to be raced over a short distance without the egg falling out. The event was held in the Sports Hall of Cooper School at Bicester, which was an ideal venue for racing the constructions. 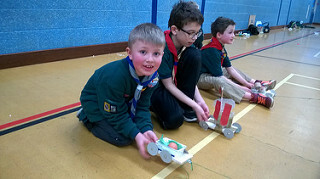 Joseph and Mac were the two Cubs who made up our team, and along with all the other Cubs taking part, were given a balsa wood base, four wheels and fixing pins, cellotape and a reel of string to attach to the front of the construction for reeling in when racing. The Cubs were also allowed to pick items from a pile of recyclable rubbish, such as cereal cartons, cardboard tubes, small plastic containers etc. to help use for their construction. By the end of the constructing period there were some very interesting designs, some more elaborate than others, with an extremely good effort by Joseph and Mac. The proof was in the racing though which was done in heats, semi-finals then finals. Joseph and Mac did well in their two heats, just missing out on a semi-final place but their construction remained intact, unlike some of the other constructions, and the egg – hard boiled I hasten to add – stayed on board. Both Joseph and Mac said they thoroughly enjoyed the afternoon. Well done to them for volunteering to take part and representing 7th Banbury Cub Pack.